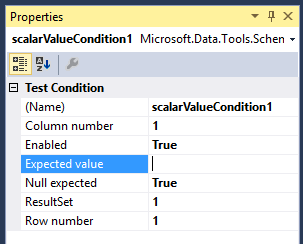 Unit test in SQL Server Data Tools has Scalar Value test condition. This test condition receives a dataset (result set) from the query. You can choose the cell from that dataset with Row number and Column number properties. This will return a dataset that contain only one cell, which means it has one row and one column. If you want to check a value from another cell, adjust the properties mentioned above. I was wondering how SSDT understand the value that we set in the Expected value property. When there’s a comparison between numbers or strings, I don’t even think about conversion problems. But what will be if we compare dates? I have not found a calendar or other tools to set datetime value. The Properties pane has a mere textbox for the Expected value. It seems that SSDT gets a string. So I decided to conduct an experiment to check how conversion really works. I created a very simple test case. I use ISO format in cast to avoid any conversion problem. SQL Server has a number of string format that can be used as a representation of a datetime. Full list is available in MSDN. When I use ISO or unseparated format, the test passes. When I set the value as ‘8/15/2014 8:20:15’, it works too. But when I set the date as ‘15.08.2014 8:20:15’, the test fails. That’s because SSDT (Visual Studio) or SQL Server has another locale or dateformat settings than the format dd.mm.yyyy.